MANILA, Philippines – For almost 3 quarters of 2015 NBA Finals Game 1, 4-time MVP Lebron James and the Cavs held a very comfortable margin until reigning MVP, Stephen Curry exploded and convincingly stole game number 1 from the Eastern Conference Champs in an overtime thriller, 108-100 last Friday, June 5 (Manila Time). James had a game high of 44 while Curry chipped in 26 points for the Dub Nation. Lebron dominated the first 3 quarters of the game, shooting almost flawlessly in all angle of the floor and demolished all Warriors who were assigned to guard him. James was really too big and strong compared to Andre Iguodala, Jason Richardson and Draymond Green who were all over him in the entire ball game. It all went down to Lebron James’ final shot with few seconds remaining in the clock where the score was tied 98 all. James missed a jumper from the left side and both squads needed an extra five more minutes to settle the opening game of this series. Clearly, the Cavs are the underdogs despite of the superstar status of King James. Warriors had a good season of 67-15 compared to Cavs’ 53-29 plus their fallen stars Center Anderson Varejao and Forward Kevin Love. 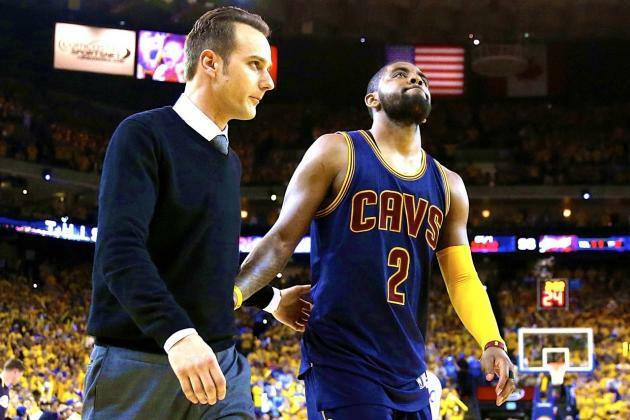 Worse came to worst when Cavs ace point guard and former top draft pick Kyrie Irving re-injured his left knee and was declared out for the whole series. Irving will undergo a knee surgery and rehabilitation that will take up to 4 months. Irving’s left knee popped off a crossover against Klay Thompson. Kyrie fell awkwardly on the floor during the overtime period but was able to got-up and sprinted to the other end. We has obviously in pain so Coach David Blatt called a ceasefire after a Matt Barnes-basket to give his hurt ward a breather. Irving rushed himself to the dugout limping and grimacing in pain. He never returned to game. Cavs only made 2 points during the extra period. The King and his Cavaliers were obviously psyched and demoralized by their comrade’s scary knee injury. They feared that the worst was coming. Looking at their bench where two of their superstars are in suits and not in game attire and a possibility of making it 3 superstars in total on bench who are not in uniforms is really terrifying. James’ chance of brining Cleveland its first championship in jeopardy? Now that Kyrie Irving is officially out of the scenario, James’ home-coming to Cleveland and a chance to have its first ever championship is somehow getting obscured. Pundits are not closing the season out. They’re not ruling out that Cavs don’t have a chance anymore and the trophy should automatically go to Golden State. This situation leaves Lebron James no option but to step-up and to be the ultimate leader and a great motivator who can push his teammates to lock their targets on their respective men and count every shot in. The same Cavaliers are no strangers in this kind of situation. They made it against East’s top-seeded Atlanta Hawks. Where Varejao, Love and Irving were all out. Aussie back-up point guard Matt Dellavedova filled-in Kyrie Irving’s shoes heavily. The Hawks felt Delli’s presence both offensively and defensively plus ex-Knicks JR Smith and Iman Shumpert’s almost immaculate 3-point shooting which was a missing link during game number 1. For the Warriors, they should keep the fire burning. They should keep shooting hot from downtown. They should leverage on Cavs’ low-morale status. They have the home court advantage. They have a healthy line-up. If they will not capitalize these advantages on game number 2, I’ll still pick Cavs to win the series. Lebron James along with his ex-Heat buddies have experienced losing finals game number but still won the title twice, first in 2012 against the Oklahoma City Thunders and in 2013 against the San Antonio Spurs. Recently, this playoffs, they did it again against the Chicago Bulls where they were down in series 1-0 but still managed to finished-off the Bulls 4-2. But if Golden State will win Game 2, it’s almost over, Lebron James will waste another year of his prime. NBA Finals Game 2 happens tomorrow, June 8 at 8am (Manila Time) at The Oracle Arena in Oakland California. Game will be aired live by BTV and in a slightly delayed telecast on ABS-CBN Channel 2.